Daily travels through Norwood, Walpole and Dedham illuminated a devastating reality of suburban poverty. For years, I noticed large groups of people milling around the town centers; loitering at coffee shops, aimlessly walking from place to place – an austere paradox to the landscape of minivans, million dollar homes and fine dining restaurants that characteristically paint the upscale suburban canvas. This visual picture, in alignment with current statistical data (poverty, subsidized housing, free/reduced lunch, etc.) tells the story of a hidden reality, one of great socioeconomic need in the suburban areas of Massachusetts. This realization, coupled with my social service-based (M.Ed, MSW) academic studies, provided the motivating impetus for creating a meal program, a community dinner with friends – a safe, judgment-free environment for people to come to enjoy a healthy dinner and loving kindness. With assistance of a handful of volunteers, my idea became a reality (November 2003) and over time and through much transition, has become the great success it is today within the Norwood community. According to the US Census Information, there are 198 (3.4%) families and 1,227 (5.2%) individuals living below the poverty level in Norwood. The Norwood Superintendent of Public Schools states that 548 students receive free lunch and 139 receive reduced out of a total school population of 3,284 students. Thus, nearly 21% of students in the public school system receive free or reduced lunch. Furthermore, the Ecumenical Food Pantry of Norwood, which provides foodstuffs to families and individuals in need every Saturday, serves over 100 families each week. Given this need, individuals and families are only able to use the food pantry services twice a month. The Greater Boston Food Bank states that there is “no one face to hunger”. Of clients/households served, 84% have a place to live, 46% are between the 30-49 years old, 52% live in the suburbs and nearly 2/3 are registered voters. Furthermore, those who have hunger needs are typically forced to make unreasonable choices: 45% had to decide between food and heat, 39% had to decide between food and rent, and 30% had to decide between food and medical care. A representative from the Norwood Health Department states: “The Abundant Table and Food Pantry have seen record high numbers because of the high heating costs and the rising unemployment rates. Times are hard economically right now, and it is comforting to know that Norwood had two meal programs available to help the people. People leave the food pantry with a week’s worth of groceries, and people leave the Abundant Table with a full stomach and full spirit.” Is there a hunger need in Norwood, Massachusetts? 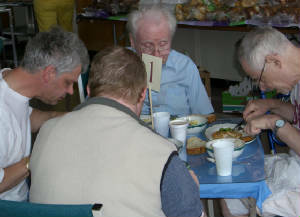 Many frequent the Abundant Table to receive nourishment through a warm, hearty meal, while others come to alleviate loneliness and depression through engagement with others. Hunger comes in many different forms, and the Abundant Table intrinsically meets both types of hunger needs through its holistic program.